The annual gala hosted by the Texas Czech Heritage & Cultural Center on Sat., Dec. 2, will honor women singers, Martha Viktorin and the East Bernard Czech Singers; musician and dance hall owner Alice Sulak; and publishers Marie Tupa and Theresa Parker. The evening will include dinner and a dance with music by The Czechaholics. See the invitation and buy tickets. In Sefcik Hall, Seaton, Texas, Alice has lived her life, so far, within the sound of accordions squeezing and brass horns squawking. She is the proprietor of Sefcik Hall just east of Temple. Her parents, Tom and Tracy, built the dance hall/bar in 1923, and Alice has been in charge since 1970. She grew up working, listening, and dancing to polkas and waltzes. The sound inspired her to learn to play them and she played saxophone in a polka band for 45 years. (She is on her sixth saxophone.) Her back gave out a while back and she had to give up playing sax, along with climbing the stairs to the dance floor. Her family helps run the hall and bar. On dance nights she can tell how much fun people are having by the sounds emanating through the ceiling of the bar below. The dance hall is unique in that it is on the second floor of the building, with a bar downstairs, and Alice’s house across the grass parking lot next door. The hall used to host three dances a week, and now holds dances just about every Sunday. She loves everyone who still comes out to dance or just sit below the hall with friends. Sefcik Hall has provided a place for people to meet, fall in love while dancing, and get married. Some of the earlier dancers are now buried within music listening distance from the hall, and widows and widowers meet new partners at the hall. Alice's family has maintained the hall for 96 years to keep the Czech music and culture alive. Martha, a first-generation Czech Texan, without professional music training, and knowing a little piano, began writing lyrics to popular Czech songs in her midlife. Martha, whose mother spoke Czech exclusively, was raised with the language. She remembers working in the fields around Beasley singing Czech polkas and waltzes as her family and others picked cotton. The family attended some parish picnics, and when she reached the appropriate age, she and her friends attended dances on Saturday nights where the bands had names like Patek, Baca, and Krenek. The sound of Czech music became the joy of her life. Martha's strong desire to retain her Czech-speaking abilities is enhanced by listening daily to Czech internet radio. There are daily programs similar to the Texas polka programs all in the Czech language. It helps her to hear spoken Czech, even if it differs somewhat from how Texas Czechs speak. After decades of enjoying Czech music in all forms, she became curious to see if she could translate, in both directions, polka and waltz songs. Martha became quite good at it, and now occasionally translates from Czech into English secular tunes for The Dujka Brothers. When John Dujka was producing the yet unrecorded song Moon Over Moravia, he thought that it could use a little of the local language and turned to Martha to translate the chorus into Czech which boosted the song up a notch in validity (not that it needed it). She has written several songs for polka Masses, including You Are My Savior. She collaborated on the lyrics with Wilma Kapavik, who has also written lyrics to other songs. 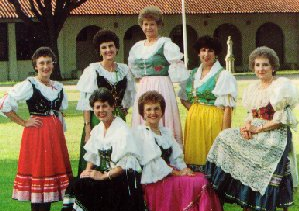 Martha was instrumental in making the Polka Mass a popular form of worship in Texas, and was a founding member of the East Bernard Czech Singers. The East Bernard Czech Singers consisted of a group of seven ladies from East Bernard, Texas. When the ancestors of these ladies immigrated to America from Moravia in the late 1800s, they brought with them the beautiful folk and religious songs of their homeland. These melodies, whether of a religious nature, Christmas carols, or lively polkas and waltzes are beautiful in their harmonious composition and stir the hearts of their listeners. These ladies learned the songs at home and at school. Feeling that it was important that the songs be preserved in some way before they became lost in forthcoming generations, and realizing a need to contribute toward the perpetuation of their Czech heritage, the ladies, in 1986, formed a singing group and produced a musical cassette tape of Czech Christmas and religious hymns. Prior to this they all had been singing together unofficially in various configurations. The group was surprised at the enthusiasm by which their project was received by the community which spurred them to continue on. From 1986 until 2000, when the group disbanded, the East Bernard Czech Singers produced eight recordings – three Christmas/Religious themed and five with polka and waltz music. Two of their songs are in the Library of Congress for the world to hear upon request. The singers also made a video with Harry Czarnek and the Texas Dutchmen. The Texas Polka Music Association bestowed multiple awards for Best Vocal Group and Best Album of the Year. Their popularity allowed them to perform at festivals and events all over Texas and Oklahoma. With the exception of the first tape, the backing musicians have been John and Mark Dujka. The founding members of the East Bernard Czech Singers were Martha Viktorin, Birdie Hlavinka, Margie Vacek, Martha Janik, Georgie Losack, Marge Hlavinka, and Yvonne Krenek. The world of Czech culture sends its thanks; without this enterprising group of ladies some of the sounds of Czech culture would have disappeared forever. Marie and her husband, Julius Tupa, made their home in Houston. In fact, they first met at Bill Mraz Dance Hall, and that’s where he proposed to her as well. She jokingly said she wouldn’t marry him if he was going to be a musician. He told her he would give it up. Both of them knew that wasn’t going to happen. “Music was his life,” she said. Julius went on to form three bands – Sagebrush, Night Shift, and Sound Connection. He also hosted a polka radio show on KYND in Houston. In 1987, Marie and Julius, together with seven other couples, formed the first Texas chapter of the Polka Lovers Klub of America (Po.L.K. of A.). The Tupas served as the group’s first king and queen. Also, that year, Julius united the statewide polka community when he began publishing The Texas Polka News, with the mission to preserve and promote polka music and dance. When Julius passed away in 2002, Marie had a decision to make – continue publishing the paper or stop the presses. She knew how much the paper meant to Julius, and with the help and support of John Rivard as volunteer editor, she took on the role of publisher. John’s wife, Marlys, also was a regular contributor to the paper, and the couple were always on the floor at dance halls throughout Texas and the U.S.
Theresa Cernoch Parker is a third-generation Texan and native Houstonian born to a German mom from Weimar (Florene Helmcamp) and Czech/Irish dad from Dubina (Willie “Bill” Cernoch). She grew up within walking distance of SPJST Lodge 88 in the Heights area and remembers going to dances with her parents at the lodge and Bill Mraz Ballroom. Theresa used her journalism degree from the University of Houston to write for newspapers, magazines, and communications departments at major corporations. She founded polkabeat.com in 2010 to honor the memory of her dad, a passionate polka promoter. The site is the only online source for a compilation of dance schedules of Texas polka bands, festivals, and church picnics. The site also has a Polka On! store featuring T-shirts, koozies, magnets, and other novelty items, along with a large selection of CDs. Almost 2,000 subscribers enjoy receiving a weekly e-newsletter listing the weekend lineup of dances, as well as photo and video coverage of festivals, band news, and a weekly laugh. The polkabeat Facebook page has more than 2,000 fans who appreciate the sharing of polka news, as well as information on all types of Texas music. In 2011, Theresa collaborated with musician Jimmy Brosch to publish the book Jimmy Brosch Remembers Twenty Legendary Texas Czech Polka Bands. More information on Julius Tupa can be found in the book. Theresa purchased The Texas Polka News in July 2014 and resumed publication of the paper in September 2014. After three years of publishing under the guidance of Theresa and Editor Gary E. McKee, the paper has been hailed as the premier polka publication in the nation. Gary uses his background as a Texas historical author and photo journalist to bring to life the history of bands, instruments, and dance traditions. Theresa brings her Czech/German heritage and years as a journalist/writer to promote Texas musicians, bands, and dance halls. Polka lovers are also dance lovers, and Theresa and Gary have continued the tradition, started by John, of covering other genres of music, including Country, Western Swing, and Cajun. And the paper has stepped up coverage of oprys and other live music venues across the state. It’s a tribute to Texas roots music. The newly designed, full-color newspaper debuted in January 2015 with polka legend Alfred Vrazel as the first cover story. Jeff Brosch, musician, artist, and son of Jimmy Brosch, led the redesign efforts, and continues to head the art department. TPN stays true to featuring a calendar listing of dances and festivals, and has broadened the list to include live music events. Thanks to advertising partners Janak’s Country Market in Hallettsville and Slovacek’s in West, the paper also has expanded coverage of church picnics, and features “polka smiles” photos every month. Special editions include Spring/Summer Fest Guide (March), Oktoberfest Guide (August), and Christmas Gift Guide (November). TPN has increased readership by 30% since 2014, and is looking to increase subscriptions another 30% by next year when the paper will celebrate 30 years of publishing in 2018. The paper launched a subscription drive in 2016 with a unique twist to thank readers who have supported the paper and polka. For every new subscription or renewal through May 2018, TPN is donating $5 of the subscription price to a dance club or music/heritage organization of the reader’s choice. Not only will the groups benefit from the donated subscription money, $3,000 in prizes will be awarded to the clubs and organizations that bring in the most subscriptions and renewals. For subscription information, visit TexasPolkaNews.com. Mark your calendar for the 30th anniversary celebration on June 30, 2018 at the KC Hall in Schulenburg, where the awards will be given, and of course, we will Polka On!